As Halloween candy takes over store shelves, advice on how to resist such candy takes over nutrition headlines. But the science of eating behavior shows that the more we try not to eat something, the more likely we are to overeat it. 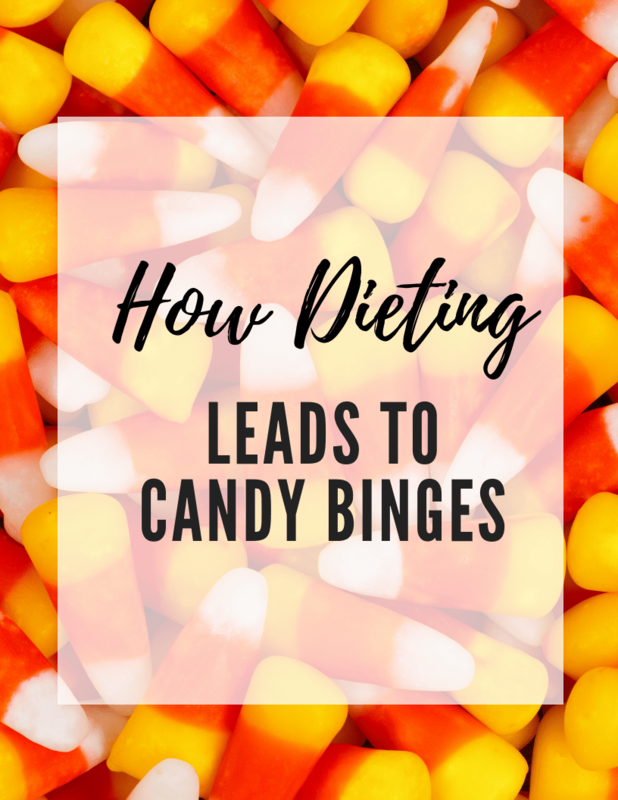 So before you vow to keep all of the candy out of your house or curse your lack of willpower, understand the science of a Halloween candy binge – and make peace with candy this year. Research in an area called food habituation shows that the more you are exposed to a food, the less your brain cares about it. As a result, your desire to eat it diminishes. This has been shown with a variety of foods including potato chips, mac and cheese, pizza and chocolate. It makes sense: Say you were told you could eat pizza for dinner every night. While that might sound great on night one, by the fifth or sixth night, the pizza will have lost its allure and you’ll likely eat fewer slices than you did the first night. Just as city dwellers adjust to street traffic noise or stop being as bothered by bad smells, people get habituated to a food the more they eat it. The opposite is also true. When you don’t have access to certain foods, the more your brain focuses on them. For instance, if you’ve ever been on a trip without access to your favorite foods, what’s the first thing you feel like eating when you get home? That’s right: the foods you missed while you were traveling. The same thing happens when you label food “off limits.” As soon as you tell yourself that you can’t have, say, desserts, candy or chocolate, your brain will concentrate on those foods and cause you to crave them. Then, when you do get access to these foods, you’re more likely to overeat since you don’t know when you’ll be “allowed” to eat them again. 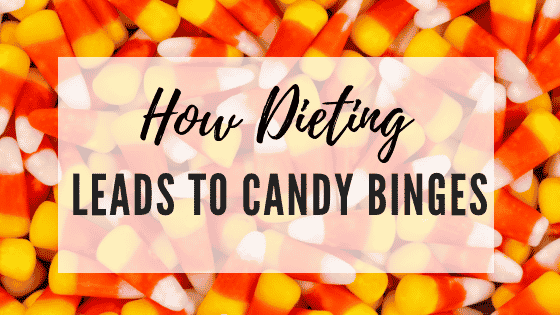 If you’ve avoided candy bars, candy corn or M&M’s since last Halloween season, you’ll want to permit yourself to indulge. But when you finally let yourself have “just one mini candy bar,” your brain lights up with interest and it’s often hard to stop. This is food deprivation backlash, or rebound eating. 1. Give yourself unconditional permission to eat. Make peace with food by allowing all foods to fit into your eating pattern. This means that choosing a chocolate bar becomes emotionally equal to selecting a piece of fruit. By letting go of any limits around food, the intensity of the desire to overeat decreases. Remember, Halloween is not the only time you can eat candy. 2. Eat what you really want. While it may seem scary to remove any limits on foods allowed; ironically, once you know you can eat whatever you like, you’re better able to tell what you want (and what you can do without). When you permit yourself to eat anything, you get to ask yourself, “Do I really want it?” You may find that the candy you used to crave is no longer as good as you thought. This means no making a deal with yourself to work out harder to burn off the candy, or to skip a meal to make more room. These trade-offs are still a type of restriction and lead to urgency and overeating. When you start to blame your lack of self-control or willpower for your latest indulgence, remember the science instead. Remind yourself that diets and food rules set you up for failure. Falling for them doesn’t mean you are a failure; it means you’re human. Are you ready to ditch the diet and rediscover the joy of eating? I work with clients virtually throughout the US, helping people who are frustrated with dieting change their relationship with food and say goodbye to diets once and for all. Learn more about my nutrition coaching programs to see how you can find balance and develop long-term lifestyle habits, no diets required. This was originally posted on US News Eat & Run Blog. Download my free e-guide Five Minute Mindful Eating Exercise and learn how to hone your mindful eating skills. Hi Polona, thanks for your comment! Hunger from antidepressants is still hunger, and ignoring it could potentially cause cravings, overeating and binging later on. I’d continue tune into your body and honor those feelings of hunger – while playing around with what meals/foods satisfy the hunger. This will take some trial and error over time as you figure out what foods help satisfy it and which ones don’t as much – it also can vary greatly from day to day in terms of which foods are satisfying.